Now I must tell you it’s barely 8 am on a Sunday morning no less, my dream last nite was to wake up around 10:00 lull in bed for a little bit, before I start the day..
As most of you know with a growing teenager, food is on the top of their priority.. I made a deal with her, set the table and I’ll get breakfast going..
wow she took the Royal Doulton set out.. Tea and 9 grains bread! Eggs, Potatoes, Smoke Bacon,Red Peppers, Green Peppers, Garlic, Parsley, Onions, Tomatoes,Black Pepper, Jalapeno, EVOO. Peel, dice the potatoes, dice everything else. in a pan add the dice bacon, then sauté the onions, garlic, peepers, add the potatoes, then parsley. Beat the eggs w/black pepper, parsley, then add the evoo to the pan then the egss and scrambled, then add the vegetable mixture, mix well..
What are your favorite breakfast? Do you like Pancakes? Eggs? Share a recipe by leaving a comment below..
Wanna Get Away to this FANTASTIC Scrapping ???? Head over to the Cuttlebug Challenge blog and check this post out.. So, did you ever have one of those days? I woke up and was going about my day then remembered Wednesday is my day to post. YIKES!!! Well this is what my brain did. I started with a great piece of K & Co. double sided really thick pretty paper. I also decided I was wanted a different fold than just a plain card. So I cut my paper 5 1/2 X 12. Then I used a borrowed Score-it and made a score line at 2" and 4" and folded the card. I wanted the pretty side with a bit of color on the flaps so I cut 2 strips to go on each flap. 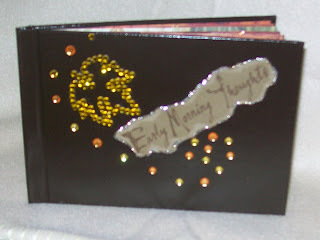 Next, I used a couple of die cuts from Spellbinders but cut them out with my Cutttlebug! I had never done this and it worked like a dream. (of course) I then ran the label through the Cuttlebug using an embossing folder. I also stenciled the design onto the focal piece. I decided to add some more interest to the card front so stamped my fav collage stamp by Stampers Anonymous several times with Espresso Ink. 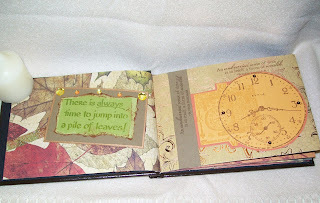 I also stamped the words in the upper right corner and attached a Prima collage flower in the lower left panel. Then I added the bit of ribbon that would carry trough to the open card. I cut and embossed the label a second time and layered it over the ribbon on two other layers. Both layers were embossed, corner rounded and distressed with more Espresso ink. I love the layers and all the texture. I am so glad to have the opportunity to create for this blog! Hope you all enjoy. Hello all and happy Wednesday. I have been playing wit my Your Story by Provo Craft. These pictures are just a few of the pages I created. I loved working with some of my favorite saying, bling and glitter! What was really great...how easy the book went together with this GREAT machine! I used paper tearing, inking the edges of pages, paper scraps, ribbon and all different sorts of bling to bring the pages to life. A dear friend of mine gave me a K & Company paper stack for Christmas and that was the background for all the pages. Thanks Linda! Have been struck by Lovestruck yet! 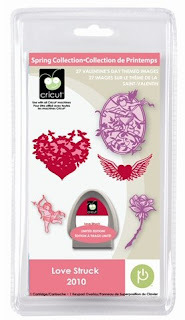 Cuttlebug Challenge is giving away not 1 but 3 of the Lovestruck Cartridges Courtesy of Provo Craft! 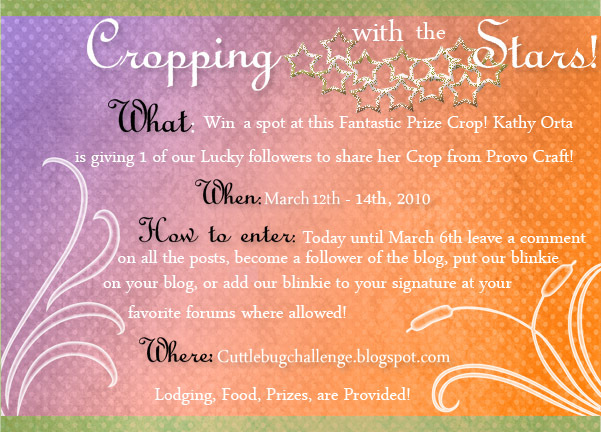 Head on over to the Cuttlebug Challenge here's the Giveaway info. 1. If you are not yet a follower, become one. All followers will receive ONE entry for a chance to win. 2. Leave a comment on this Blog. ONE entry for a chance to win will be given for each comment made on ANY post throughout the week … beginning Sunday, February 7th and continuing through Valentine’s Day, Sunday, February 14th, until 11:55 PM Eastern Time. That’s it … That’s all you have to do. Now how SWEET is that? 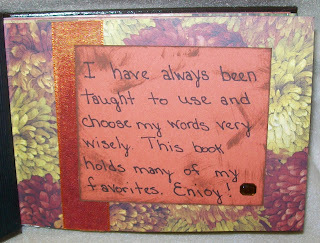 Winners will be announced on this Blog on Monday, February 15th at 6:00 PM Eastern Time. Thank you for joining me with my second post to this great blog! With Valentine's Day coming this weekend I have done charming card to send/give to the one you love. Product list: Stamps by Prickley Pear, embossing folder by Cuttlebug & ink by Tsukineko. 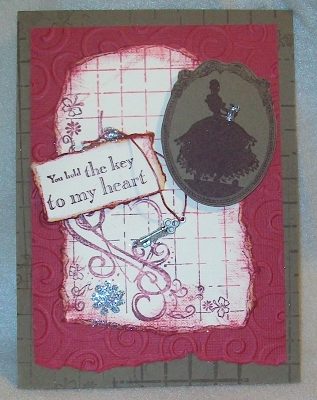 I started this card with brown background and stamped a simple background using one of my focal stamps. I stamped the image several times using VersaMark to leave the subtle water mark affect. 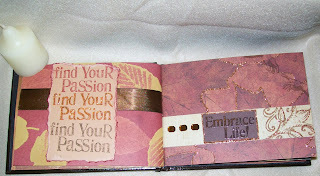 Next I used the swirls Cuttlebug folder to emboss the red card stock. I chose to tear the bottom rather than make a straight edge to add some interest. I had to run the paper through the Cuttlebug twice as this was a longer piece of card stock. Since I was using brown and red papers I chose an off white layer to to make the other elements of the card pop. I then used the background stamp again but used the entire image. I used several different colors of ink layered on the stamp to make it variegated in color. I then tore the edges and inked the edges with the same inks the image was stamped in and attached to the card front. I stamped the words on the same off white paper and inked the edges and attached to the card front with a pop dot. Next I stamped the victorian lady on brown, cut it out and attached to the card front with a pop dot. The last two elements were then added. A key to go along with the phrase and a few touches of glitter. I made my string to match by running it over the ink pad. This was a fun and easy card to make. Hope it inspires you to make a special card for your special someone! CHA Winter 2010 in California and Martha Stewart! Take a look at these beautiful new Border Punches by Martha Stewart Craft Collection through EK Success! Loving them! PS Don't forget to tell us what you think of the new punches? Hello All! 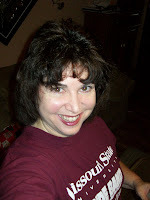 My name is Kristi and I am thrilled to be part of this blog. Thank you Maggie for the kind invite! I woke up this morning after not sleeping very well, looked out the window and saw ANOTHER gloomy day! I then walked into my studio and pulled out bright, fun colors to created a spring card! I started with a base card in a funky orange and stamped a floral image by Prickly Pear in VersaMark ink. I added the embossed Doodle Bug design stripe paper and thought it needed texture so of course I ran it through my Cuttlebug! I then found a scrap of hot pink mirror paper and embossed that too. Put the two together, added a bit of ribbon and some large photo corners and atached that tothe card front. I tore the words out of a different piece of Doodle Bug paper. I picked words that I thought were fun. The three words up top are held together by a pretty pink brad and some more ribbon. I ran a small scrap of mirror paper through the Cuttlebug and cut out the embossed flower and edged it with a silver Krylon pen. I then put several flower combinations together and placed them on the card. I used some foam mounting tape to pop up the bottom flower and then popped up the flowers on top of the embossed piece. I was so great to think SPRING! The groundhog in Springfield, MO, did not see his shadow so here's hoping!